Ideas for your email newsletter that can help boost customer engagement and increase traffic to your retail store. You’ve laid the ground work. Got your search rankings up, setup a lead capture systems, implemented an email marketing system, but are now stuck and wondering to yourself, what the heck should I write about? Below is a quick two step exercise to help inspire some ideas as you’re planning your newsletter publication schedule. It’s important not to see newsletter writing as an exercise to create content for the sake of content. This is not about writing anything just to fill up your newsletter word count. The end goal is to keep your brand front of mind, and give customers a reason to come to your store. This means writing to needs and motivations. I serve <customer X> by <doing something> that helps them <receive an emotional benefit>. I serve : travellers, professionals, retirees, mums, students etc. Go through the process of thinking this through, writing it on a post-it note, call it your ‘purpose statement’, and stick it on your wall. This will help put yourself in the mind of your customer so that you can better brainstorm in step 2. Now back to the task at hand. Below is a list of ideas for your newsletter. Review them against your purpose statement in step 1, and think about each as you would a customer. How does each idea help your customer achieve the benefit you wrote down? 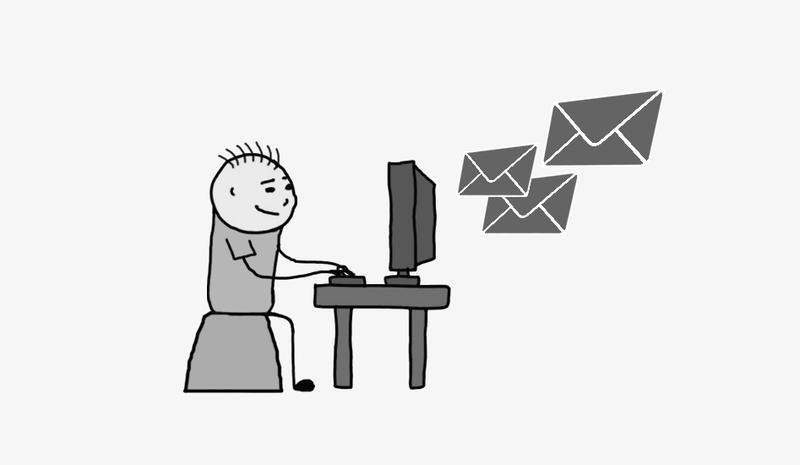 What you can write about in your email newsletter. New product launches: What’s new and innovative – either in stock now, or coming soon. “New” is one of the great hooks in selling. It feeds our innate sense of curiosity. Your suppliers or your R&D team are a great source for ideas in this area. What’s trending in your industry: People love to know what others are doing. This utilises the social proof heuristic. If you can educate your customers about what others are talking about, it helps nudge those who are not sure what to buy over the line. Influencer bloggers are a great source for ideas in this area. Find them, track them via their RSS feed. You can also take a look at Google Trends. Tips and Advice: Help your customers get the most out of purchased product or service. There’s a few principles at play here. Firstly it reinforces in your customer’s mind why they bought your product. It’s also a great on-boarding tactic that will help increase product usage. And being helpful will endear your customers to your brand. But also the more you give, the more you get back (aka the reciprocity principle). Ideas for tips and advice can include; seasonal considerations (eg, fresh produce or fashion), highlighting a particular service (eg, loyalty programs or free service at X months), how to guides for using particular features, etc. Case Studies: These are similar to “Tips and Advice” but go deeper and are use case specific. Research shows stories are a great educational tool. People are more engaged with stories than a generic product description. A story that highlights how your product and service was used and created an outcome will have higher readership and be more convincing – the ultimate sales tool. Meet a new team member: This taps into the “liking” principle in influence. People gravitate towards people. Think of your customers as your tribe. They identify with you because you share interests and values. Highlight how your new team member aligns to these and invite customers to come in and meet them. Workshops and classes – There’s always one staff member on the floor or in you service team who lives and breathes what you do. Ask around and see who might be able to help facilitate a workshop around their expertise subject. Harness their passion and turn it into a simple 1 hour event. Information nights – These work particularly well for services such as travel, finance, or health care. But even product retailers can utilise them. Topic ideas are endless, but rather than coming up with one yourself, why not survey your customers and ask them what they’re most interested in. Celebrity appearances – Are there any rock stars in your industry? Inventors, owners, influencers, enthusiasts, book writers, etc. Give them a call and ask them if they wouldn’t mind presenting in your store. They’ll often see it as a promotion opportunity for them so it needn’t cost anything. Price Promotions: Free, Discounts, and Coupons – This is last on the list for a reason. I’m not a fan of discounting because it reduces profits. If you have a quality product that serves a need and is somewhat unique, there’s no reason you can’t sell it. Having said that, there’s no greater pull then a bargain. Free is always the biggest draw card, followed by Discounts, and Coupons (doing something to redeem rather than just be given). Use these tactics sparingly and only include them in your newsletter after you’ve communicated value as per above ideas. Hopefully some good food for thought. The best strategy I find for generating newsletter ideas is to review the above alongside a Newsletter KanBan Boards labelled; 1 Ideas (ToDo), 2 Writing (In Progress), and 3 Published (Done). Don’t sweat the details or get stuck on how the final article will look later. Simply dump any idea no matter how trivial or stupid it might sound into the “ToDo” bucket for review and prioritisation later. Check out our Campaign Analytics Dashboard - tracking marketing effectiveness across Email, Social Media, Search and Display Advertising.